Sign up and receive Property Email Alerts of Farms for sale in Stellenbosch Farms, Stellenbosch. 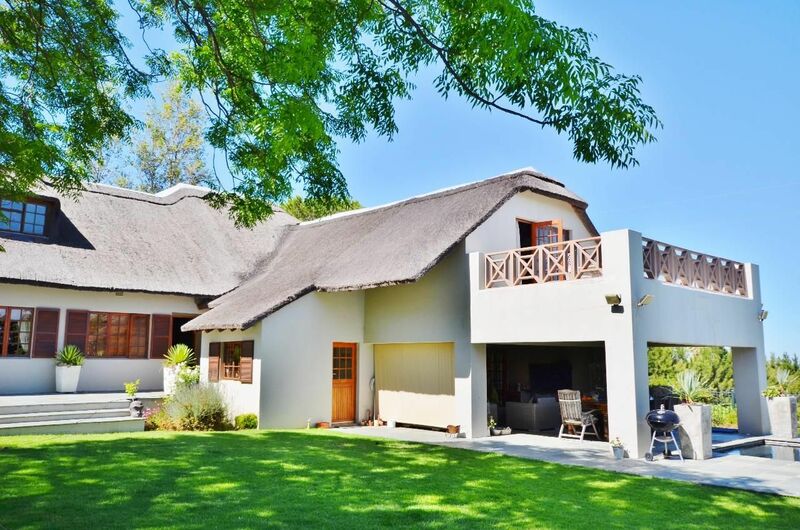 Do you want to live up against the slopes of the Helderberg mountain in vineyards with views of Table Mountain, Helderberg Mountain and False Bay? Buy a third share of a company which owns about 13 hectares. The share includes a 5 bedroom thatched roof house with wonderful living and entertainment and areas. A covered patio with a built-in braai leads out to a rim-flow pool and ......with views of Table mountain overlooking a vineyard. The house area (erf) is fully fenced with electrical wire and is connected to an alarm system. The seller has been living in the house for about 20 years - without any security issues or break-ins. The share includes the usage of a fenced area of about 3 hectares which the present owner (shareholder) uses for cattle - but would be perfect to use for horses with ample space to built your own stables on. The share could also give you access to the vineyards - should you have the need to cultivate vines and make your own wine. This change in land usage need to be negotiated with the other 2 shareholders. The vineyards is at present contracted out to a company who cultivates it on behalf of the shareholders. Sign-up and receive Property Email Alerts of Farms for sale in Stellenbosch Farms, Stellenbosch.